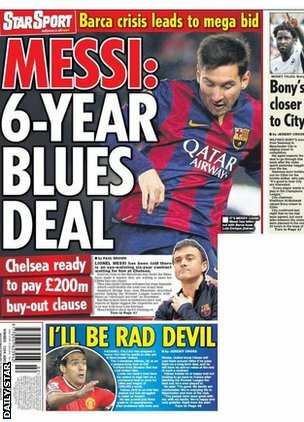 Chelsea are preparing to match Lionel Messi’s £200million buy-out clause to bring the Barcelona star to Stamford Bridge, Daily Star reports. The Argentina captain will be offered a massive six-year deal to join the Blues, with his wages also being matched to lure him to the Premier League. Chelsea manager Jose Mourinho stated previously that the news surrounding a move for Messi were untrue, however the 26-year-old is currently frustrated with his manager Luis Enrique, fuelling rumours of a possible exit. The four-time Ballon D’or winner didn’t show up for training on Monday, and Enrique wasn’t able to deny that there is an ongoing conflict. “I neither confirm nor deny those reports,” he stated. “The things that are part of the team always remain in the changing room. If things do not resolve itself at the Nou Camp, then Chelsea are ready to pounce to sign Messi this summer. But they will have some stiff competition, with the likes of Manchester City and Paris Saint-Germain also keen on signing one of the world’s greatest ever players.